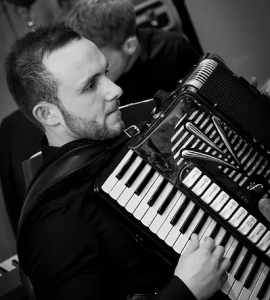 All Scotland Accordion Champion 2010 and 2015, Craig Paton and his Scottish Dance Band have been delighting audiences and dancers around the world for the last seven years. Since releasing his first CD at just 15 years old, in 2009, Craig has studied at the national specialist music school in Aberdeen, performing at 1st Diploma level, leading to extensive tours with his own band. Craig has represented the World Burns Federation, performing at the official launch of the Royal Mint Burns Coin and the Royal Mail Burns Stamp Collection in London in the presence of the then Prime Minister, Gordon Brown. More recently, Craig and the band have recorded three broadcasts for BBC Radio Scotland, including the live edition of Take the Floor from Celtic Connections and the Glasgow Royal Concert Hall in February 2014. This specific outing led to a nomination for Dance Band of the Year at the MG Alba Scots Trad Music Awards, in turn taking the band on farther and wider travels.